Spain entered the twentieth century with all of her old values still alive and strong: on the extreme right, a yearning for absolutism; a vigorous liberalism among the intellectuals and many middle-class and working groups which carried forward the best traditions of the nineteenth century; a military establishment which was greatly overstaffed because of the wars with Cuba and the United States; a church that was more cautious now in its political activities, but which was still a very potent force in the national political life; and a rebellious sentiment in favor of separatism in Catalonia and in the Basques provinces. But one new element had entered the national life, which was not in existence before: the extreme left. The radical revolutionary ideas of the nineteenth century, the ideological and financial aid received in Spain from foreign radicals, the appalling working conditions inside Spain itself, and finally, the stimulus of the Russian Revolution –these things brought about the emergence of a real extremist group of the far left. They originally called themselves anarchists and syndicalists; later left-wing socialism also made their inroads. These extreme radicals exerted their influence mainly among the labor unions. The extremists of the left, like the extremists of the right, bear a tremendous responsibility for the downfall of decent government in Spain in this century. Both groups were so egocentric that they did not see, or were unwilling to work for, the common good. The king, Alfonso XIII, during the first ten years of his reign, showed a real inclination to identify himself with the more liberal elements of his country. But as time passed he became more and more irritated with the constitutional government, and more and more friendly to the conservative interests in Spain: the big landowners, the army, the church. The liberals had now their intellectual leadership. The tree planted by Francisco Giner a generation previously in the Institución Libre had come to fruit. Education was finally paying off. But four months later the Austrian archduke was assassinated in Serbia, and the First World War broke out. The country sought refuge in neutrality. The king was cautious in not favoring openly one side over the other. He was married to an English princess, but the Queen Mother was Austrian. Alfonso XIII walked the tightrope with his country for the four years of the holocaust. Spain could not remain idle while the war went on. Orders for Spanish commodities poured into the country, and with them foreign influences grew apace. There was a considerable amount of industrial development with foreign capital. Gold deposits in the Bank of Spain quadrupled in four years. The national currency rose in value, and Spain’s economy began to pick up. In spite of all the bad things about the war for Spain, the country at last felt itself again an integral part of Europe. Madrid cast aside its provincialism and became the most important neutral city of Europe; many matters of international policy and finance were handled there. The spirit of “renovation” was in the air all over Spain. The newspaper El Sol, which was to become the great paper of the Second Republic, led the move to liberalize the country. In 1917 came the crisis. Backed by the big industrialists, the parties of the left, and with strong popular support, a large segment of the Cortes assembled and demanded thoroughgoing political reforms. What might have been a crucial switch to a real parliamentary democracy, had there been proper leadership, turned out to be nearly a national disaster when the extremists of both sides took control. The extreme right, led by the king who appointed a conservative minister and cabinet officers, met the movement with a blast of ice water. The whole country felt cheated, and the labor unions howled bloody murder. The Socialist Union in Madrid, a moderate group, took the lead in calling for a general strike. The far left Syndicalist Union of Barcelona followed suit, and soon the strike had spread to all the main cities. The Spanish economy was paralyzed; transportation and construction came to standstill. The unions demanded a socialist democratic republic, and took the barricades. Their hotheaded leaders had gone much too far, and delivered the country straight into the hands of the group they hated most: the military. Army units assaulted the barricaded workers, several hundreds were killed or wounded, two thousand were imprisoned, and the strike was ruthlessly suppressed. The army had “saved the country from anarchism,” and now stood supreme. Extremes on the right and on the left had produced the crisis, and the right, which was the stronger of the two, had handled it with summary effectiveness. After Spain had lost Cuba, Puerto Rico and the Philippines as a result of the Spanish-American War, she turned her attention to that last outpost of the Spanish empire, Morocco. Only an unrealistic stubbornness and pride made her hold onto this territory which brought the country far more trouble than it was worth, and cost far more than it ever returned, both in money and blood. But Spanish honor was involved. This was the region where the Moors and the Moriscos who had been thrown out of Spain had gone to settle. But if the Spanish government felt this final urge to imperium, the poor Spanish workers and peasants who had to go to Morocco as soldiers did not. Gone was the day when at the beat of a drum every poor devil of Spain would rush for the nearest enlistment booth. The deception of that charade had been repeated so often that even the most ignorant countryman no longer felt any desire to seek glory on the field of a battle. In 1921, there was a dreadful disaster in Morocco. The urge to finish off the Moroccan war quickly led the Spanish soldiers into the trap set for them by the Moroccan leader Abdel-Krim where they were slaughtered. It was an inglorious disaster. Every effort was made to dissociate the king from what had happened, but the facts spoke for themselves. Anger and disappointment mounted and nothing could save the government now. The generals in Spain decided that it was time to take over, and General Primo de Rivera was selected for the job. “The ambition of every Spanish general is to save his country by becoming her ruler.” While the Englishman or North American is generally content to work within the party or group, the Spaniard is passionately anxious to take things into his own hands. Primo de Rivera, an Andalusian, was just such a man. He was in the true Spanish tradition, and in the true tradition of most popular Latin-American dictators. In him the masses could see themselves and their own passionate patriotism. The king knew very well what was going on all the time this military plot was being hatched, but he was so perturbed at his own loss of popularity because of the Moroccan fiasco that he approved everything. On several occasions the king had denounced parliament, and during the twenty-two years of his reign he had thirty-three ministries. Under such conditions stable government was impossible. In 1923, when the coup came, Alfonso XIII breathed a sigh of relief, although instead of ruling through the army, as he had hoped, he became a prisoner of the military clique. The dictatorship would in fact push Spain forward in a material way. Has not the catch phrase “order and progress” been the panacea of every dictatorship? 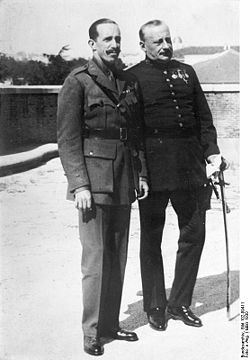 Primo de Rivera personally took over the command of the Moroccan war and led it to a victorious conclusion. He modernized the Spanish transportation system, and like Mussolini “he made the trains run on time.” He also embarked on a large-scale highway construction program. Large-scale enterprises were invited to establish branches in Spain. The army saw to it that the country enjoyed a period of order. What was the price? First, there was a rigorous censorship of the press. The Ateneo of Madrid, the country’s most famous literary, scientific, and artistic club, was put under lock and key. The president of the Supreme Court was removed. Even the textbooks were revamped in order to make them safe from a clerical point of view. Pressure was put on teachers to force them to attend mass, regardless of their wishes. In these measures Primo de Rivera was supported by the army, by the church, by business, and by big landowners. At first, he had also been favored by a considerable proportion of the workers as well. But he did not long hold the support of the majority. The intellectuals were the first to oppose him. Unamuno, who was already a man of tremendous stature, became violent in his opposition. He was exiled to Fuenteventura and France and did not come back as long as the dictator was in Power. In the final years of his rule Primo de Rivera made an attempt to establish a civil government under his leadership, but popular feeling was now strongly against a dictatorship of any kind. Liberalism had grown rapidly among all sectors of the population excepting only those of the extreme right. There were many priests in the church who were also convinced liberals. They opposed the dictatorship and supported the forces working toward the Republic. The world depression of 1930 caused a worsening of economic conditions inside Spain, and opposition to the dictatorship mounted steadily. In that same year the government closed all Spanish universities, which had become a source of rebellion. Disorders among the workers multiplied; in 1930 there were five hundred and four strikes, and in 1931 a proportionately even greater number. People began to sign Republican manifestos regardless of whether or not they faced imprisonment. Crowds assembled and shouted; “Down with the king!”, who had been linked irretrievably with the dictatorship. They did not even mention the name of the general. When the elections were held, in April 1931, they indicated how wide the opposition was to any military or monarchical regime, and King Alfonso XIII fled from Spain. It was time for the Republic. The men who founded and governed the Spanish Republic were as heterogeneous as has ever appeared in the pages of European history. First were the intellectuals, the men of ideas. Then came other liberals of various shades and coloring, some of whom were good Catholics but most of whom were not. Next were the Catalan and Basque separatists to whom the Republic meant local autonomy. Finally there was the Spanish Left composed of the anarchists, the socialists, and the communists. All of these people called themselves Republicans, and a large majority of them were anticlerical. This opposition to the church as a political influence had become one of the marked characteristics of Spanish liberalism in general. Under the Republic it turned into a violent church-state conflict. Michael Bakunin, a Russian aristocrat, and a man of gigantic size and energy, was the creator of Spanish (and European) anarchism as a political government. He was at first a follower of Marx, but later broke with him. The two were in bitter conflict between 1868 and 1872. Bakunin wanted to destroy the state, to destroy God, and to destroy the wicked and powerful rich who symbolized both. He believed that if these forces were made to disappear society would spontaneously reform itself into smaller local segments which would give rise to the happy life. Many writers have commented that Spanish anarchism is unadultered Iberianism. It represents the magnificent independence of the Spaniard set loose in the arena of political action. The anarchist ideal is absolute liberty, an absurd concept, of course. But in Spain there has always been a fascination for the absurd. It is essentially the religion of Quixotism. In the early 1900’s another movement of the far left made its entry in Spain: syndicalism. It was a variation of anarchism and soon merged with it. Its philosopher was a Frenchman named Georges Sorel, who published a book on the subject in 1908. It is worth pointing out that while anarchism had a Russian background and syndicalism a French origin, the ideas of both movements were most widely and successfully carried out in Spain. The medieval history of the country and the ineradicable local feelings of the Spaniards account for this in part, but the deplorable religious, economic, and political conditions inside Spain must also bear their share of the responsibility. The principal weapon of the syndicalist unions was the general strike, whereas the anarchists acted violently, by regularly killing political men. The anarcho-syndicalists believed passionately in one final great outbreak of violence which would end all violence. After this the new society would emerge. But first the powerful and the wicked must be killed. They were the ones who had held humanity back from the natural realization of its social ideal, liberty. The anarchists did not wish just to confiscate the luxuries of the rich, but to exterminate them. They were moved by an almost ascetic morality which reminds one of the early Christians and Jews. In many of their collectives they strove to eliminate all alcoholic beverages, tobacco, and even coffee. They suppressed the brothels in their areas with an efficiency never achieved either by the state and the church, which often winked at this social “escape valve.” The anarchists never made an ideal of a “higher standard of living,” as did the socialists. Thus, the anarchist movement was Spanish idealism carried to a wild extreme, but it was truly and essentially Hispanic in nature no one should doubt, regardless of its point of origin. The man who possesses nothing comes naturally to have a deep hatred for material things. The Spaniard’s scorn of luxury is almost innate after so many centuries of doing without. He is a natural-born stoic who exalts the stern values of his ancestors. In the small villages of the country today, even in the cities, many Spaniards disapprove of the elemental luxuries and will even boast that they do not need heating in their houses, such is their physical stamina. A Spartan character and absolute liberty–this is the ideal of many Spaniards. The Spanish anarchists appealed to this primitive pride and strength of the race, and in this lay a great part of their success. There were many things in Spain which led to believe that socialism was the natural modern form for the Spanish economy and government to take. These factors were: a tradition of local collectivism, an all-embracing church, a strong centralized government, and last but not least, a group of highly educated and highly intelligent socialist leaders. Put these factors all together, and theoretically the mixture might produce an effective socialist state. Practically the attempt was made to do just that, but it failed miserably and ended in the civil war. Socialism began in Spain in the 1870’s at about the same time as anarchism, but its growth was much slower, for socialism required more training and more control. It was not until 1888, with the organization of the Unión General de Trabajadores, the UGT, or General Union of Workers, that the socialist movement really got under way. The socialists believed in parliamentary processes, in a disciplined nation-wide union, in a national state, and in raising the standard of living. All of these beliefs separated them from the anarchists, as did also their relatively high union dues. The Spanish socialists fought energetically for honest elections, in the firm belief that this would further their chances of assuming power. They also campaigned vigorously against governmental corruption, nepotism, political bossism, and illiteracy. It was the interplay and union of all these social forces which brought about the Second Republic, and it was the inevitable conflicts among these same forces which caused its disintegration. Socialists, anarchists, liberals, peasants, extreme leftists and moderate republicans, a good many enlightened Catholics, the Basques and the Catalans, with their longing for self-rule–such were the human bases of the Spanish Republic. Was it reasonable to hope that these utterly diverse elements, suffering from bitter conflicts among themselves and even within each individual group, could remain united long enough to transform Spain into a modern, parliamentary democracy? Such was the expectation and the dream of the great majority of the Spanish people.